Spending time in the hospital is very expensive. Rather than giving you an itemized list of everything that might go into a hospital stay, I’ll talk about something that should be almost as good: bills from a hospital, complete with final payments. That should give us a pretty good idea of the value of hospital services, since insurance companies have access to all the costs and specialize in being able to offer the minimum amount any institution is likely to accept. What I’ll show are copies of three actual hospital bills to patients. I’ll use them to take you through some of the typical aspects of hospital billing and payment. And, as you’ve probably guessed, it’s going to look a little strange. On the next line is the amount the insurance company paid: $2,052.95—just less than 10% of the total due! Ouch! Doesn’t that leave the patient on the hook for the remaining $19,172.54 (still about $10,000/day, which would be a little hard on most of us)? No, because the next line is the insurance Adjustment, which is the amount that the insurance company miraculously convinces the hospital to forgive. In the end, the hospital charges twenty-one thousand dollars, the insurance company pays two thousand dollars, the patient pays fifty dollars (that’s right, just $50) and the rest just goes away. This second bill is for a patient who spent three days in the hospital and has completely private health insurance. This patient had some complicated surgery performed on his eye. Now, the Account Summary is a bit different on this bill. The total billed is well over one hundred thousand dollars ($126,714.57); enough to bankrupt just about anyone. The next column over is “patient savings” which is just another term for the adjustment or the insurance discount. In this case, the discount is also well over one hundred thousand dollars (again, almost the entire bill). The insurance payment in this case ends up being just under twenty thousand dollars ($19,527). This time, the patient owes nothing. So the hospital bills the insurance company the price of a luxury sports car and the insurance company returns a payment that’s only enough to buy a Honda Civic. This third bill is for a patient who was very sick. This person spent 11 days in the hospital in September 2014 (September 17-September 27) and even spent time in the intensive care unit. How much did the the hospital (John Muir hospital) bill for this extended hospitalization? Over $367 thousand! That’s enough money to buy a very decent house most anywhere in the U.S.
Of course, most of that enormous sum wasn’t paid by anyone to anyone. 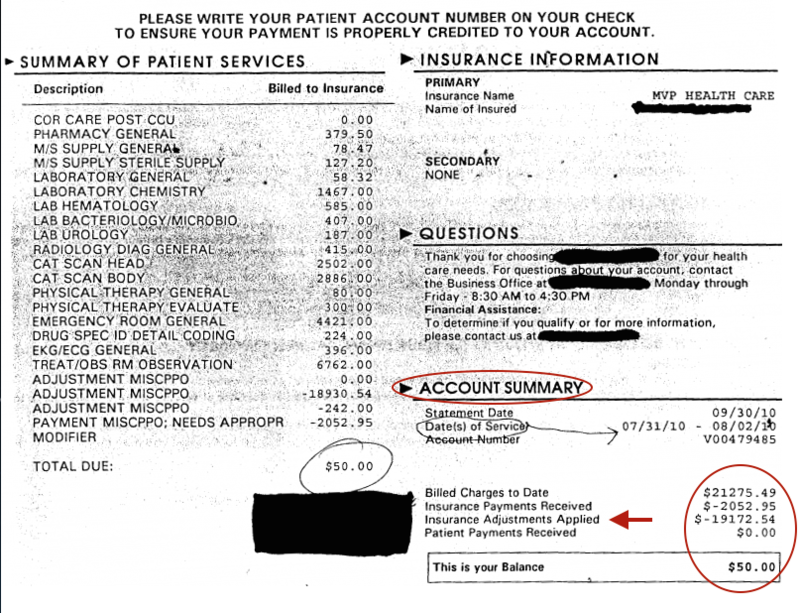 Three lines below the line that says “Total charges” you again see “adjustments.” In this bill more than $264 thousand, or just over 70% of this enormous bill is again discounted; completely disregarded by the patient’s insurance company. (Again, this is private insurance that this person got through their employer.) 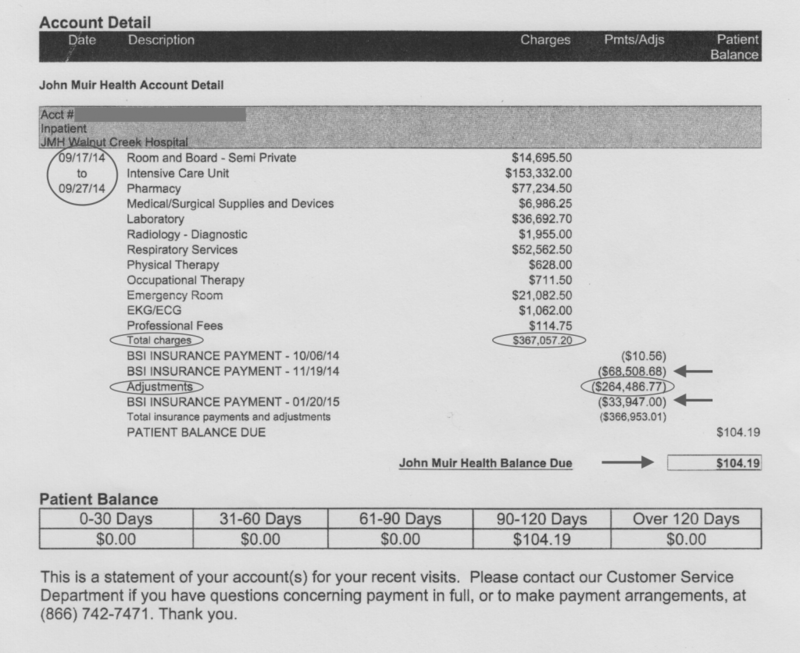 In the end, the total paid on this bill by both the insurance company and the patient combined is just over $100 thousand ($102,570) That’s still a lot of money, but far less (only 28%) of the gargantuan sum that was billed. What’s going on here? How Hospitals Create Their Bills. The method of reimbursement for a hospitalization differs substantially for different insurance companies. It’s not just that the rate is different for each service, but that different payers will reimburse different services. Medicare, for example, bases their reimbursement rate solely on the patient’s diagnoses. A diagnosis of pneumonia will get a fixed Medicare payment regardless of how long the patient stays in the hospital, what tests are ordered or what treatment is given. Other payers might pay by the day, or for each individual service. But the hospitals do all their bills the same way, no matter who the payer is. So the best way for them to get paid is to put anything that might be reimbursed by any payer on every bill. An insurance company will happily ignore the things it doesn’t intend to pay, but will never add anything the hospital leaves out. It will also happily pay less than the hospital asks, but certainly will never pay more. In other words, there is no penalty for billing too much for a service, but if the hospital doesn’t bill enough, it short changes itself. The only potential penalty would be for billing for a service not provided or a diagnosis not justified. Now let’s look at what all this means. When a business sends a bill, to you or to another business, you pretty much expect the bill to show the value of what they provided, and therefore what they expect to be paid. But an insurance company pays the hospital based on pre negotiated rates, no matter what the bill asks for. The hospital can turn away all patients with that insurance, of course but, for each insurance company, that would mean turning away a lot of patients—the insurance companies are now very big. So because the hospitals know that they’ll only ever get less than what they bill, the process of hospital billing has stopped being a normal business transaction, and turned into something more like a kid daydreaming about his Christmas list. But it works, (well, not really), as long as it’s just a game between the hospital and the insurance company. Here is where it goes Totally Wrong. Hospitals see no problem in sending bills to insurance companies for five to ten times the amount that they actually expect, because they are simply playing the game that the insurance companies fashioned. But remember, they only produce one kind of bill, and it’s designed to send to someone who holds all the cards (an insurance company), and so can just refuse to pay anything they didn’t already agree to pay. That’s their game. But what happens when you have to play the game with the hospital alone (if you don’t have insurance, or if your insurance doesn’t cover that stay for some reason). Then you’re on the hook for the entire amount. Most hospitals have a policy that allows people to negotiate for a lower amount, but most people don’t know this. And don’t expect the hospital to tell you about it, let alone help out. So even if you can remember to negotiate while you’re convalescing from a long hospital stay, good luck trying to get the deal the insurance company gets. For the average person, this is no small matter. In the first case, a two day hospitalization that the insurance company got for $2,100 (after the insurance adjustment), would cost an uninsured person over $21,000. The adjusted charge ($2,100) would be a pretty nasty kick in the finances for most families, but they could bounce back. The unadjusted charge, which is what you’ll get if you don’t have insurance, is an almost certain trip to bankruptcy. And you’d better believe the hospitals will go after you for every penny. Here’s a copy of a letter one of my patients brought me. 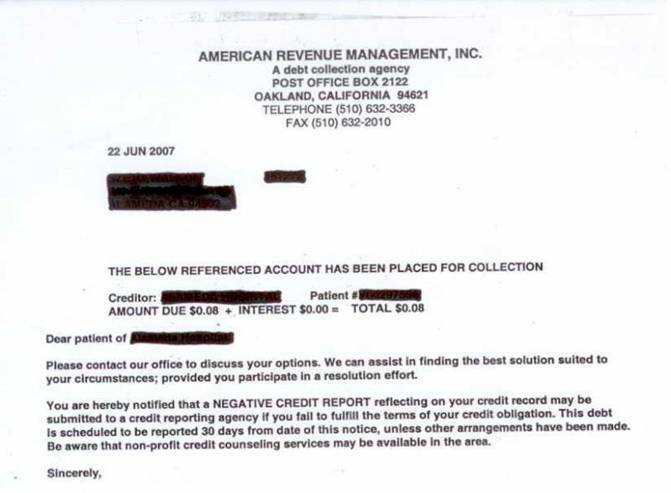 As you look at this letter, remember: This 8 cent debt was SOLD to a collection agency, and they used a 44 cent stamp to send it. This problem of excessive mark-up doesn’t just apply to people who are hospitalized. Hospitals charge the same amount for a service regardless of whether or not the patient is in the hospital. Anyone getting routine tests or a diagnostic workup from a hospital is likely to be charged five to ten times what an insurance company would pay for it (five to ten times what the service is really worth). 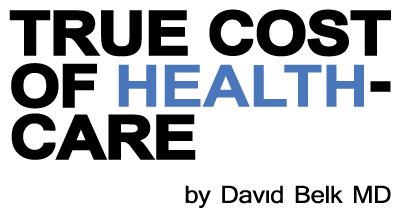 So people are completely dependent on their health insurance for even small medical costs. In what other industry would you do this? Would you use your car insurance to buy windshield wiper fluid or replace a burned-out headlight? Would you use your homeowners insurance to replace a screen? In medicine, people are routinely billed several hundred dollars for trivial tests that shouldn’t cost more than a car headlight, just because they don’t have insurance, or the insurance company denied coverage for that test. This isn’t just a problem for patients. Just because the hospitals are playing the game doesn’t mean they’re winning. Some aren’t even even breaking even. Many small community hospitals are currently in deep financial trouble. There are probably a number of reasons for this but much of it probably has to do with the fact that small hospitals don’t do well when they’re playing a game designed to pit large hospitals against large insurance companies. Rather than trying to collect a fair amount for each affordable service directly from patients, hospitals go through the insurance companies for even the most mundane fees. In order to do this, each hospital needs a large staff of billers, who spend thousands of hours each year chasing after the money that’s owed them. That’s administrative cost, which they need to cover out of insurance payments. And, since each patient only brings in a small profit, each denial puts them in a financial hole. Their answer: lean harder on the patients who owe them money. How many ways is this system broken? As I said at the very beginning, one of the biggest problems with medical costs is that the real costs are so well hidden in all these games that almost no one even knows what they are, let alone what to do with them. This applies to doctors as much as patients. We saw how patients can easily be confused into buying drugs for far more than they cost, just because they have insurance. Doctors are run around just as much by the absurd system of insurance reimbursement. Now, we find that even the biggest players; the hospitals, are playing the same crazy games by the same crazy rules. But now it begins to really hurt the patients. It’s frightening enough to have to stay in the hospital because of a serious illness. Then add the worry of a potentially crushing debt, simply because a mistake was made in billing or charting, or because your insurance company just wants to play games. Hospitals often try to justify placing this burden on patients to make up for the financial problems the insurance companies give them. (The insurance companies blame the hospitals, of course). In other words, they both make the case that they’re bullies because they’re being bullied. The irony of this is remarkable. How can hospitals complain about not being paid after doing so much in so many ways to discourage direct payment. Again, in what universe does this make any sense?